Some Laphroaig's from the show today. One of my favourite distilleries, so always a pleasure to review some! Already reviewed the Masterpeices bottling, and these are the other two I had at The Whisky Exchange Show London 2016. Been curious to try the Lore after some crazy good reviews. Nose: Typical, sea shore, Islay malting floor, some fruit, some plasters. Taste: Soft, smoky, medicinal and mineral development, plasters, sea water, wet rocks. Finish: Medium/Long length. Peat and malt. It's hard to compete with the quarter cask really. This is nice whisky but disappointing for the high price. 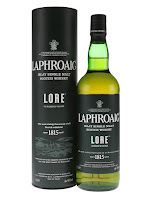 Nose: LAPHROAIG! It's a big, peaty brute. Mineral, sea shore, some medicinal notes with creamy biscuit. Everything I wanted from the Lore turned up to 10. Taste: Bam! Medicinal, creamy, mineral sea shore notes, iodine, plasters. 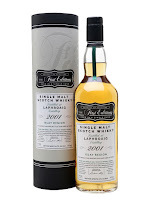 Really sings, was this matured in Laphroaig's no.1 warehouse? Finish: Medium/Long length. Recedes, creamy and medicinal.